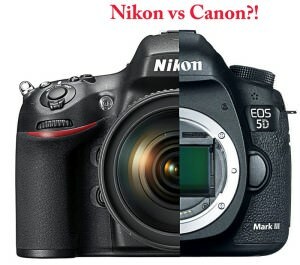 Canon vs. Nikon. So what’s the conclusion? It is one of the most controversial and heated debates in the photography world. There are entire websites and forums dedicated to it and the fans of each brand seem to be tireless in this age old struggle. When you have two photographic equipment manufacturers that have written history like these two have, it’s bound to happen. Practically, out of ten cameras, about eight are Canon and Nikon. This isn’t based on any statistics, but if you have a look around, I think you’ll agree. Both of these brands have had a tremendous influence on how photography is being practiced and perceived today. They both have a long history, and the tradition of the highest Japanese quality behind them. They are ultimately the designers and builders of the cameras that we love so much today, or of iconic machines we look back to with nostalgia. I don’t believe there is any true way of nominating one in front of the other because both brands are incredibly good at what they do, and they give us magnificent tools to perform our art. However, at the end of the day, the question still remains on the lips of many photography and camera enthusiasts: “which one is best for me”? Many people would prefer someone telling them exactly the brand or the camera they should shoot with. It would spare them the time and energy they are already spending trying to decide what the best system is, or what camera takes the best pictures. The truth is a lot further than many would expect. In their restless quest for the best camera or the best brand, many people lose sight of the big picture, of what is truly important in becoming a successful photographer. It is undeniable that being a successful photographer means using the right tools, but that is the last item on a longer list of things that need to be checked. Having the best image quality has never been an issue with either Nikon or Canon. I have said this many times, and I am just one of many voices who keep repeating it: no matter what camera you have, it will not make you a better or a lesser photographer. The cameras that we own and love, or that we think of buying, are wonderful instruments filled with amazing technology, but at the end of the day, it’s important to remember that that is all they are…instruments. The value behind a great photograph lies not in the camera it was taken with, but in the hands that used the camera. 1DX, D4, D5200, T4i…Olympus, it doesn’t really matter. It might sound strange or even wrong, but think about it this way: you are a creative person, maybe a professional, much like a writer or an artist. Will your work be admired or bought because of your gear, or because of what you are capable of? The most important investment you will make in your quest for becoming a successful, highly regarded photographer, is in yourself, not your gear. The most advanced technology and the most impeccable glass in the world will be no substitute for good education, esthetic sense, vision and determination. At the end of the day, this is what truly counts. A talented, experienced and confident photographer has no problem shooting with any kind of camera, regardless of the name on it, because he masters the principles by which all cameras work. I believe there is no real difference between these two brands in terms of quality. When you buy a DSLR, you buy a system. You marry into the whole family. If you already own a Canon or a Nikon and have doubts about it, you might want to look for the real problem somewhere else. If you’re wondering what to buy, consider if you have any older lenses you might use because it would be an important factor in the decision. If not, you might as well flip a coin because you won’t go wrong either way.